Global elites descending on Davos for the World Economic Forum faced urgent warnings from Oxfam and the IMF on Monday that the international economy is at risk, as swelling inequality stokes public anger. 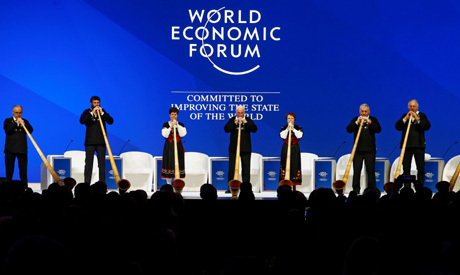 Even before the official kick-off of the annual week of networking and socialising by the world's rich and influential, it was clear that this year's event would be shadowed by increasing instability and an upsurge in populism. The IMF cut the global GDP forecast for this year to 3.5 percent from the 3.7 percent projected in October. For 2020, the estimate was trimmed to 3.6 percent. "The bottom line is that after two years of solid expansion, the world economy is growing more slowly than expected, and risks are rising," IMF chief Christine Lagarde told reporters in Davos. "Does that mean that a global recession is around the corner?" she asked. "No. But the risk of a sharper decline in global growth has certainly increased." IMF chief economist Gita Gopinath pointed to the uncertainty surrounding Britain's divorce from the European Union, with no deal in sight just weeks before Brexit is meant to take effect on March 29. "It is imperative for leaders to resolve this uncertainty immediately," Gopinath said. The UK charity found that the world's 26 richest people -- three of them set to come t to Davos this week -- now own the same wealth as the poorest half of humanity. "Extreme inequality is out of control," Oxfam executive director Winnie Byanyima told AFP in an interview. While billionaires saw their combined fortunes grow by $2.5 billion each day last year, the world's 3.8 billion poorest saw their relative wealth decline by 11 percent. The IMF released its report at the annual gathering of economic and financial leaders and once again urged action to defuse the risks. Several major economies saw sharp downgrades to the GDP estimates, including Germany, Italy and Mexico, along with a smaller cut for France amid the "yellow vest" demonstrations that have riven the country. However, the US and China, the world's two largest economies and the source of much of the global risk because of a trade war, did not see revisions. The US is expected to grow by 2.5 percent this year and by 1.5 percent in 2020. China's GDP is forecast to expand by 6.2 percent in both years, as the Asian giant endures an unaccustomed slowdown. An "escalation of trade tensions ... remains a key source of risk to the outlook," the IMF warned, pointing to the sharp decline in stock markets in the final weeks of 2018. Washingtonand Beijing declared a 90-day truce on December 1, but the risk remains that tensions will flare up again in the spring and "casts a shadow over global economic prospects." So far, a fiscal stimulus in China has cushioned the impact of the trade disputes, but the IMF insisted the two sides "resolve cooperatively and quickly" their trade disagreement. Beyond the trade risks, the month-long US government shutdown and the possibility of a no-deal Brexit alarmed the IMF. It forecast 1.5 percent growth for Britain in 2019, the same as in October, but warned the estimate is fraught given the unknowns of Brexit.